Marbella eliminating obstacles to starting a new business | Marbella Marbella – Adelante! Small businesses such as these are expected to boom in Marbella following new deregulation of licensing. 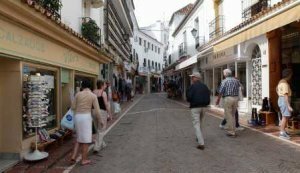 Marbella City Council’s business authority announced on Wednesday that it is introducing a large-scale revision of business regulations to remove much of the bureaucracy making it difficult to open new businesses in the city. The government initially plans to approve the first ordinance, which will make licensing more open. Adapted from a European Directive which came into force in December 2009, the highlight is that in most cases small business owners will no longer need permission to start their operations. The initiative will permit business owners to merely declare that they have started an operation, rather than going through a lengthy licensing procedure. This declaration will be enough for most businesses to start; businesses requiring environmental, health or safety regulation, as well as entertainment establishments including bars and clubs, will still need licensing. In exchange for the new concession, municipal inspectors will visit businesses to verify after-the-fact that everything contained in the advance declaration is true. According to the Councillor for Commerce and Public Highways, Alicia Jiménez, new businesses will have 20 days or so from the date of their declaration to establish operations. Then, a municipal technical trade representative will inspect the business and its documents to verify that its operations correspond with the description in the declaration. The ordinance otherwise provides for a strengthening of controls and a framework of penalties to punish those who violate their own declarations. Meanwhile, businesses that continue to need licenses will face much a shorter wait to receive their permits under the new provisions, reduced from six to two months from the time that documentation is filed. ‘What we have to do ultimately is to fill a void because there was no regulation on licensing of open businesses’, Jiménez said. The councillor added that street vendors, as well as other very small businesses, will not even need to submit advance notice. ‘With this ordinance, the citizen will also have more information about the entire process, and this transparency will boost economic activity’, Jimenez said. The Councillor said that there have been 408 requests for licenses so far this year, of which only 50 have qualified. City Council has awarded a total of 282 permits to date.